BAPTISM SEMINAR READY TO BEGIN? After you attend the second session, you will receive a Certificate of Completion. This certificate is good for four years for Catholics who have completed the Sacraments of Initiation; Baptism, Confirmation, and First Eucharist. You must complete Baptism Seminar prior to receiving your Date of Baptism at Our Lady of Peace Church. 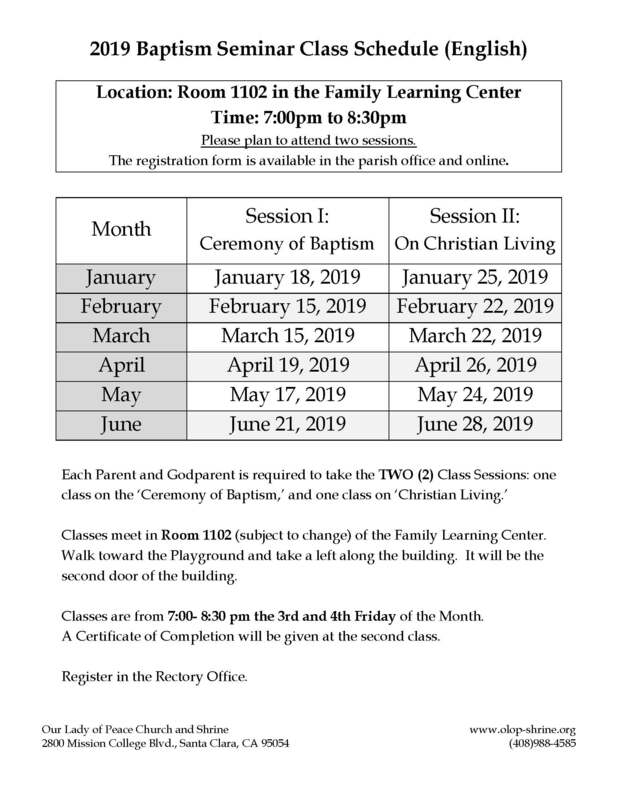 You may register in either the Rectory Office or the Adult Religious Education Office for Baptism Seminar. You may also mail in your completed registration form. You may not register over the phone. Complete one registration form for each person who plans to take the class. Arrive on time. If you are more than 15 minutes late, you will be asked to re-register and to repeat the Seminar class at another date.